This Dutton-Lainson 2-speed, direct drive standard-duty winch is designed for multipurpose horizontal pulling operations. 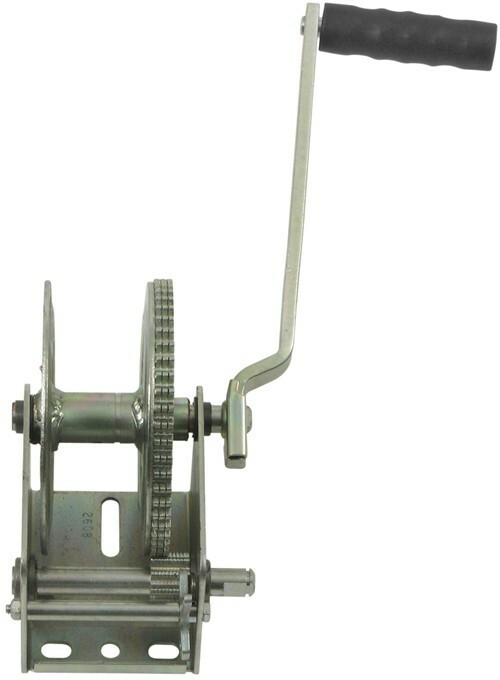 Lowest Prices for the best trailer winch from Dutton-Lainson. Dutton-Lainson Hand Winch - TUFFPLATE Finish - 2 Speed - Direct Drive - 1,600 lbs part number DL14521 can be ordered online at etrailer.com or call 800-298-8924 for expert service. This Dutton-Lainson 2-speed, direct drive standard-duty winch is designed for multipurpose horizontal pulling operations. Winches are not to be used as hoists for lifting, supporting or transporting people, or for loads over areas where people can be present. 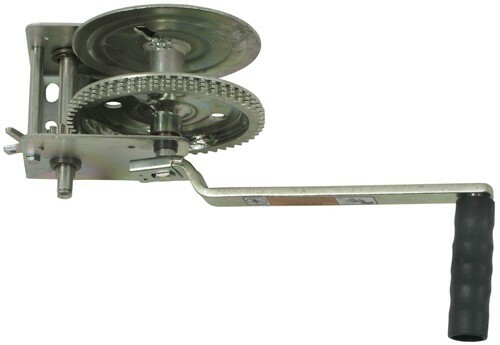 2-Way manual ratcheting winch makes loading and unloading your boat easy. 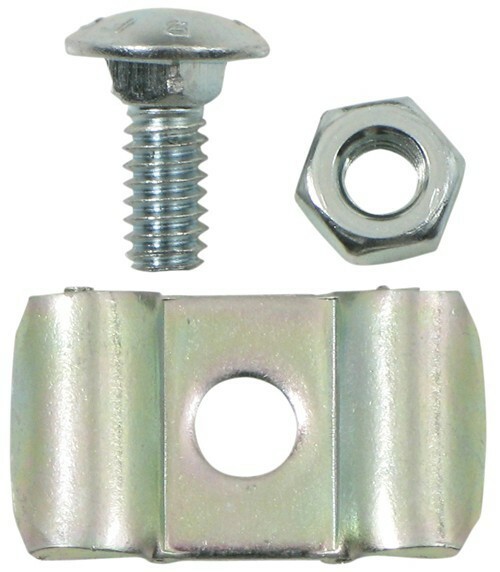 Zinc plating resists rust and corrosion, making it ideal for marine applications. Strap included. This Dutton-Lainson 2-speed, heavy-duty winch is designed for multipurpose horizontal pulling operations. This Dutton-Lainson industrial winch is designed for heavy-duty vertical lifting operations. Crank handle clockwise to lift the load, counter-clockwise to lower the load. Features automatic brake. Hand Winch Strap with Safety Hook, 2" Wide x 20' Long - 2,600 lbs. Replacement Quick Attach Winch Handle for Dutton Lainson Winch - 9-1/2"
Speaker 1: Today we are going to take a look at the Dutton Lainson Two Speed Direct Drive Hand Wench with the TOUGHPLATE finish and a 1600 lb. weight capacity. Now this is a standard duty wench it's designed for horizontal pulling, so it's ideal for boat trailers and other pulling applications. It has this ratcheting handle here and on the end of the handle uses a nice ergonomic grip on it. And this is a quick attach handle, so it allows you to easily change from speed, like its in now to the high speed, or the direct drive for a 1 to 1 gear ration.The way you remove the handle, it has a little handle clip at the bottom, you just push in on it, it will slide right off and then again, just push it in to attach it. It will click right into place and now you are ready to go. And again, if you want to move it back, just push in on the clip, slide it in, it locks right into place. The gears on this are a high carbon steel heat treated gear, and they use a zinc TOUGHPLATE finish on the whole wench.Now the TOUGHPLATE finish has about three times the corrosion resistance of a standard zinc plating and about 30% greater corrosion resistance when compared to powder coating. Now on the hub drum itself, right here on the shaft, it does have permanently lubricated barrings, it does use this reversible ratchet paw, you can see this ratchet right back here, that when it's installed or up, it will give you the ratcheting. And if you just push it down it will remove the ratcheting and will just let that free wheel, just like that.And nice thing about this ratchet paw, it is reversible. So basically what you can do, is you can remove it, reverse it around, and it will allow the cable to either wind off either the top or the bottom of the reel, whichever way you prefer just by reversing that ratchet. Now this part is made in the USA. Few specs on it. The gear ratio, when it's in low speed, like it is right now, where I got the handle, that will be a 5.4 to 1 gear ratio and basically what that's telling you, it will take 5.4 revolutions of the handle to give you 1 revolution of the drum.Now this is a direct drive wench, so if you remove it, take it off the low speed, and then you put it on to the higher speed or the direct drive. That's directly on to there, so that's going to give you 1 to 1. So that's 1 revolution of the handle is 1 revolution of the drum. So you can see that's a direct drive one to one ratio. Now the drum hub diameter, which is this part right in here, it's 1 1/8 inches diameter. Maximum drum capacity it will use a cable, a rope, or a strap.Now if you use a cable, or a rope the capacity will be 1/4 inch diameter 58 feet in length. If you do use a strap it will be a 2" wide strap by 45 feet in length. Now if you do use a cable or a rope, they do include this cable keeper. Let me see if I can move this around just to show you here. Right on here, I've just temporarily installed it, but you can see it's the mounting hardware, and what that does it allows you to mount, when you go to install your cable or rope to the drum, you run it through here, attach it down there to get it started then you can wrap it around the drum. So this cable keeper does come with it.Capacity again on this is 1600 lbs., the handle length, which would be measured from the center here to the center here is 9 1/2". The base dimension on this wench, the length of it is going to be right at 5" long the overall width of the base is right at 3 7/8" wide. If you notice it does have multiple mounting holes to fit your application when you install it.And again, just to show you, like right now, we do have it in the direct drive or 1 to 1 position. And again if you flip that down, that will release it and allow it to free wheel and if we click it back in, move it down to the lower speed, you can see in that will give you 5.4 to 1 ratio.But that should do it for the Dutton Lainson Two Speed Direct Drive Hand Wench with the TOUGHPLATE finish and the 1600 lb. Capacity. Order: RelevanceNewestRating - High to LowRating - Low to High This Dutton-Lainson 2-speed, direct drive standard-duty winch is designed for multipurpose horizontal pulling operations. Do you have a question about this Trailer Winch? The Dutton-Lainson winch # DL14521 handle cannot be moved to the opposite side. But take a look at # DL14527. You can move the handle to the other side with this winch. The only difference is that the handle on this winch is bolted on where as the other one has a quick release that is not bolted on. The length of the base of the Dutton Lainson Winch part # DL14521 that you referenced is 5-3/16 inches, the width of the base is 3-5/16 inches and the overall height is 4-1/32 inches. We don't carry a winch that will hold 80 feet of 1/4 inch vinyl wire. The closest we come is the # DL14527 and # DL14521 which will handle up to 58 feet of 1/4 inch cable. Or there is # DL15403 which can use a 5/16 inch cable that's 47 feet. I believe the best option you have would be to get a Dutton-Lainson Hand Winch # DL14527. This winch can have the handle mounted on either side of the winch, has a 1,600 lb capacity and gets bolted on. The Dutton Lainson Winch # DL14521 that you referenced cannot have the handle switched because it is a two-speed winch. I attached an FAQ article on hand winches for you to check out also. There are no bearings associated with Dutton-Lainson winch # DL14521. You can look at the exploded view of the winch that I received from Dutton-Lainson to identify the part or parts that you are looking for. With that information I can determine if it is a part we have or if it is one I can have added to our site. I spoke to my contact at Dutton-Lainson and he informed me that reversible ratchet means that you can reverse the direction you have control of, but you will need to remove the ratchet assembly and reinstall it in the opposite direction to do so. I was told that you could have the strap pull over the top or pull under the bottom. For a strap you may be interested in a Hand Winch Strap with Safety Hook # DL24249. Highest quality trailer winch for the best price. Most detailed, accurate trailer winch information available.